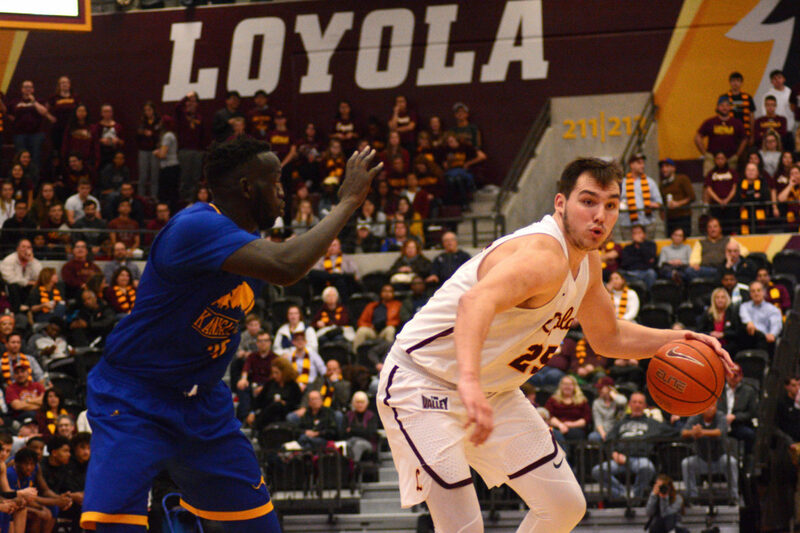 In its sixth Missouri Valley Conference (MVC) game of the season, the Loyola men’s basketball (12-7, 5-1) team defeated Indiana State University 75-67 Saturday afternoon in a rematch of the conference opener. “Indiana State kept fighting back and our guys didn’t panic and stepped up and hit some big shots,” Loyola head coach Porter Moser said in a statement. Loyola’s defense proved unmatched as Indiana State only led the game once with 12:47 left in the first half. The Ramblers tallied 21 defensive rebounds and managed six steals. Both teams had trouble controlling the ball, though — Indiana State committed 12 turnovers and Loyola turned it over 11 times. The Ramblers ran a fairly efficient offense, dishing 15 assists while shooting 25-for-47 from the field. Four players scored in double figures, led by Cameron Krutwig’s 16 points and 10 rebounds — his third double-double of the season. Redshirt senior guard Marques Townes also had 16 points, while sophomore guard Lucas Williamson added 14 points and eight rebounds. Redshirt sophomore guard Aher Uguak added 10 points to the effort — including two slam dunks which brought down the house. The beginning of the second half went back-and-forth, with the Sycamores pulling within three points. But the Ramblers managed to pull away thanks to big three-pointers from Williamson and first-year guard Isaiah Bujdoso to hold on for their 12th win of the season and fifth in MVC play. With the loss, the Sycamores fall to 2-4 in MVC play, including a 79-44 loss at Gentile Arena Jan. 2. One of their wins was against University of Evansville, which defeated Loyola 67-48 Jan. 8. They were led in scoring by Tyreke Key’s 19 points and shot 50 percent from the field in the rematch with Loyola. 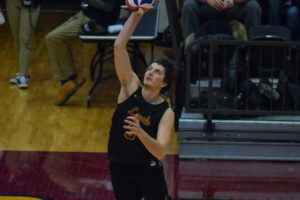 Despite the win, Loyola remains tied for first with Valparaiso University. The Crusaders defeated University of Northern Iowa 75-66 to maintain a tie for the top spot. Their lone loss came to Loyola at Gentile Jan. 15. The Ramblers are next scheduled to take on Missouri State University Jan. 23 at 8 p.m. in Springfield, Missouri. The game will be broadcasted on CBS Sports Network.